A recent poll conducted by Serbian think tank Libertarian Club LIBEK reveals some alarming misconceptions among Serbia’s youth about its economy. The results show that public trust in the benefits of democracy and market economics is lower than previously thought. They reflect a global trend. In both new and established democracies, there is increasing evidence that political leaders are failing to conduct sustainable reforms that address the socio-economic concerns of citizens. Additionally, economic literacy among citizens in many countries remains low, with many admitting they do not fully understand current complex political and economic issues or the long-term consequences if necessary reforms are not made. This allows political opportunists to gain unfair advantages and opponents of democracy to exploit and exacerbate failing transitions and promote their illiberal agenda. If the perception that emerging democracy and the market economy have failed grows, people will entertain non-democratic alternatives. 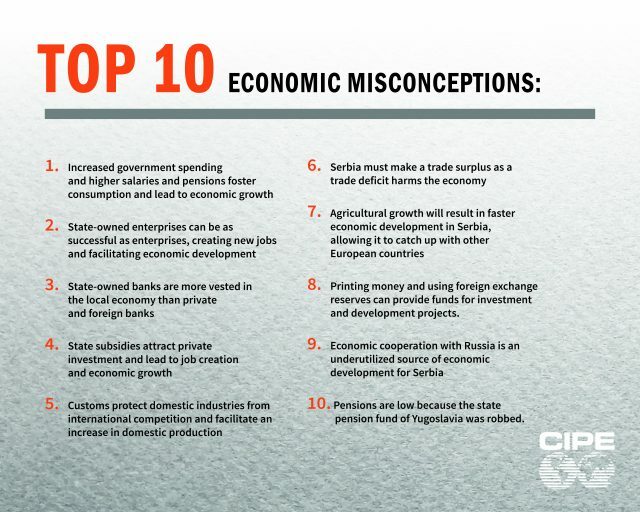 In its newly released guidebook on Top 10 Economic Misconceptions in Serbia, LIBEK outlines key findings from the survey and subsequent meetings of thought leaders. In 2017, LIBEK polled more than one thousand Serbians aged 18 to 25 and got very mixed results. More than 80 percent of respondents expressed dissatisfaction with democratic development in Serbia and few described their economic situation as good. Over half of those polled said they prefer authoritarianism to democracy. Approximately 25 percent said that democracy is not good for the economy, with nearly the same number of respondents favoring state intervention in wealth distribution, including regulation of income inequality. Most polled were also against the privatization of state-owned enterprises. The majority of youth said that the government, not the private sector, should create jobs. At the same time, survey data indicate some signs of a positive attitude toward market economy concepts. Experts believe that Serbian youth do not see a clear connection or positive relationship between democracy and economic growth and appear divided on how the two concepts impact quality of life. To support civil society in its efforts to advance democratic and market economy values in Serbia, the Center for International Private Enterprise (CIPE) is helping LIBEK enhance its capacity to develop policy recommendations and media advocacy. With CIPE support, LIBEK convened thought leaders from both the public and the private sector in 2018 to begin a dialogue on responsible economic policies addressing the underlying challenges facing the country. As a result of these efforts, LIBEK recently unveiled a set of economic policy proposals intended to assist Serbian reformers in developing effective approaches to successful economic transition. It should be noted that LIBEK acknowledges the important role that the state has in creating an enabling environment for business to thrive, but rejects the idea that it should run the country like a business. In Serbia, the government and public administration remain the leading sectors for employment. The salaries in these sectors, together with pensions, which the state generally supports as a measure to foster consumption, make up about half of Serbia’s public expenditures. It is however a proven misconception that this type of government spending leads to economic growth. LIBEK therefore advocates for an increase in expenditures on education and infrastructure, which in turn encourages private investment and fosters healthy economic development. Additionally, LIBEK argues that public sector salaries and pensions can only be increased through economic growth, rather than the other way around. In a market economy, the private sector and consumers decide what they will produce and purchase, with little government intervention. LIBEK therefore also highlights how it impedes trade. That customs protect domestic industries from international competition and facilitate an increase in domestic production is a misconception. High import duties result in higher prices of foreign goods which may give an advantage to domestic products in the same market. According to nearly half of the youth respondents of the LIBEK poll, it is necessary to protect domestic production by introducing customs duties. Moreover, more than 66 percent believe there is no need to import products that can be produced in Serbia. The responses indicate that few understand that the price increases impact not only foreign industries, but also domestic companies which may not have the technology or resources to make all products consumers need or want. In most cases, additional costs are paid from consumers’ wallets. Lack of competition also impacts the ability of Serbian businesses to innovate and be globally competitive. Experts assert that Serbia’s customs practices can impact its economy in several ways and, in the long run, do not benefit either the country or its producers and consumers. Any other assertion is simply not true. As the LIBEK poll shows, many of the country’s young people appear to accept economic myths that are circulated without question and that may lead them to support opportunistic policies. LIBEK and CIPE conclude that there is a clear need for programs that can demonstrate to Serbia’s citizens the benefits of a market economy in a democracy that provides for inclusive growth with long-term sustainability. Through their work, CIPE and LIBEK seek to strengthen and mobilize important voices, drawing on homegrown beliefs that educate the public and amplify pro-reform narratives. The ideas are being shared with practitioners, academics and the public via a number of platforms. CIPE encourages its adaption in other countries and regions to inspire informed policy-making and activities to increase public awareness about democratic and market economic principles.